Character studies of the Scottish Covenanters. There are many volumes which deal with that terrible yet glorious period in the history of the Scottish church between the restoration of Charles II and the accession of William III. 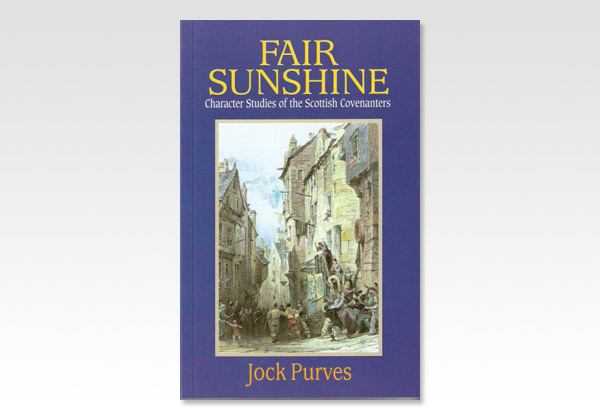 But Fair Sunshine deserves a place alongside the very best of them. Whether Jock Purves was writing about James Guthrie at the beginning or James Renwick at the very end of this time of martyrdom and suffering there was a lyrical quality about his treatment. When taken together with this spiritual perception and moral earnestness this drives every one of these biographical chapters to the heart of the reader. Jock Purves, who died in 1988, was also the author of The Unlisted Legion, in which he described his colorful and dramatic experiences in Lesser Thibet and on the Indian-Afghan Frontier during the years 1926-30 when he served as a missionary with the Worldwide Evangelization Crusade. He was made a Fellow of the Royal Scottish Geographical Society in 1931.